Fans enjoying baseball in the luxury areas of PNC Park have more than just their favorite Pittsburgh Pirates to cheer about this year. For the second season in a row, Levy Restaurants has chosen the George J. Howe Company as its supplier of candies and snack mixes to the Lexus Club and luxury suites at what is regarded by many as the best ballpark in America. “We are always looking to enhance the experience for our guests and we couldn’t do it without the folks from George J. Howe," said Kyle O'Brien, Lexus Club Manager. "Howe's expertise and product selection have made it possible to raise the bar on guest experience." Lexus Club patrons enjoy many all-inclusive amenities, including a game seat no more than 12 rows behind home plate, an exclusive dining area with buffet stations and concierge services. 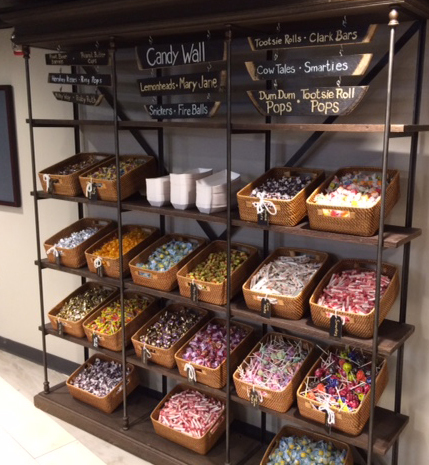 The "sweetest" perk, however, may just be free access to the Lexus Club's famous "Candy Wall". Here, fans can indulge in handfuls of their favorite confections throughout the game, such as Tootsie Pops, Lemonheads, Salt Water Taffy, Snickers, and Milk Ways, as well as nostalgic offerings like Bit-O-Honeys, Mary Janes and Root Beer Barrels. Howe's signature snack mixes, including Cranberry Nut Mix, Cajun Mix and Smoky Mountain Mix, are also available, both in the Lexus Club and luxury suites. So, while PNC Park's most famous wall will always be the one standing 21-feet high in right field in honor of Pirates' great Roberto Clemente, the Lexus Club's Candy Wall, just steps behind home plate, appears to be a close second.